I am so excited to share this post. 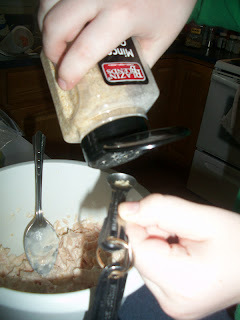 This is our first day posting "Cooking with Kyle". Recently Kyle has acquired at new nickname in our house. He is taking a health class in school, and has turned into the food police almost overnight. I wrote about our grocery store adventure in my shopping with the food police post last week. 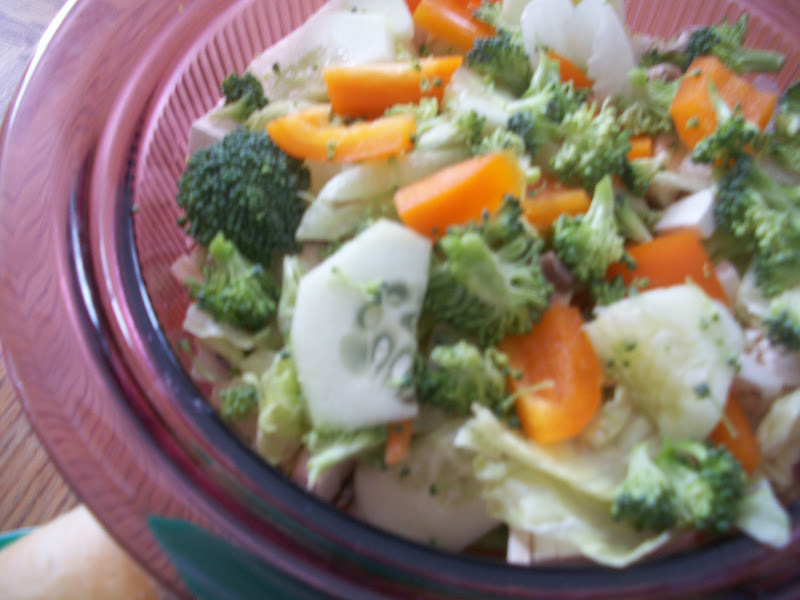 Since he wants everyone to eat healthier, I came up with the idea that he could share a healthy kid friendly recipe each week. Today we had a snow day, so he decided to make us lunch. 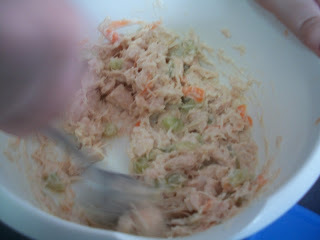 This is his own recipe.... Chicken Salad Surprise. 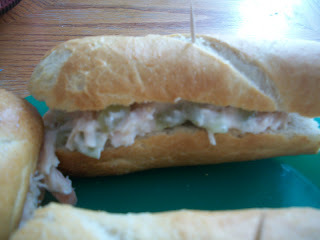 For the sandwich bread, we used a Crusty French Baguette that was on sale this week for only .99. I followed the directions and cooked it at 400 degrees for 20 mins. It cooled, while he made the chicken salad. 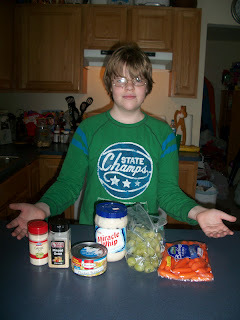 He added 3 tablespoons of Miracle Whip. He did not measure it, just eyeballed it to make sure he had enough to cover the meat. He cut up about 10 grapes into small pieces. 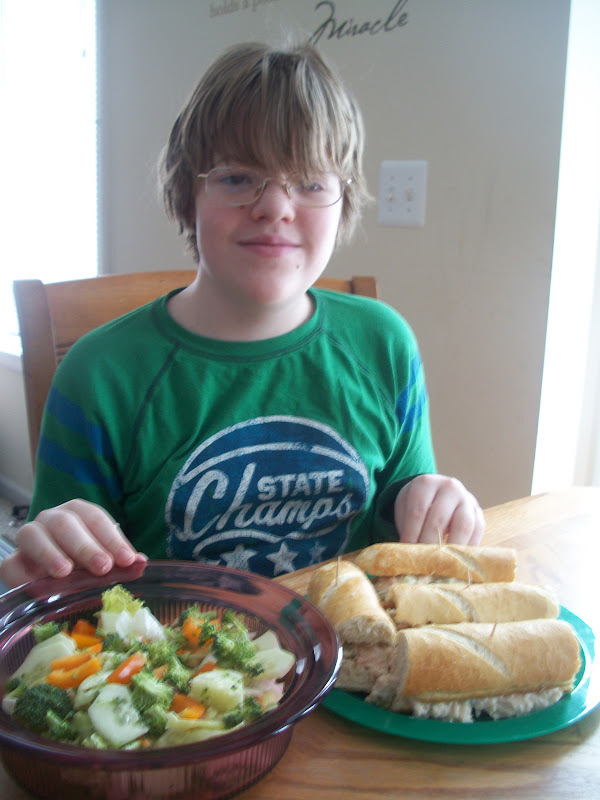 He felt the smaller the better so picky eaters might not realize what they are eating. I then shredded a little bit of carrot for him. 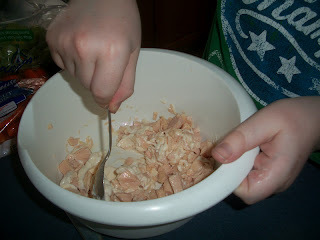 He added it to the chicken mixture, and mixed well again. 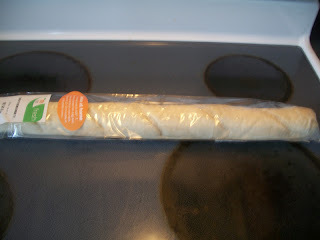 I offered to cut the bread for him, but he wanted to do it himself. 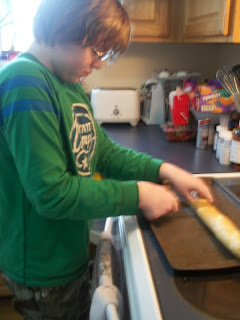 He was using a sharp knife so I was a bit nervous, but he did a great job! He cut the baguette into sandwich size pieces. He then placed the "secret ingredient" on each roll. Shhh, don't tell, it is a piece of spinach. When the chicken salad is on roll, the spinach is completely hidden. Doesn't it look good! We added the toothpicks only for picture purposes. 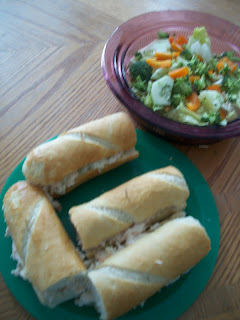 The sandwiches were served with a side salad made with all the veggies I bought on sale at the Meijer Dollar Sale. This chicken salad was delicious. It had the right mixture of sweet and tangy. 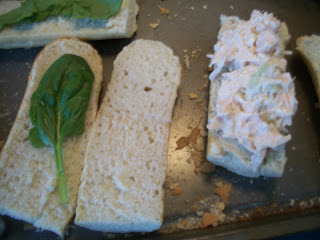 I knew that the spinach was in the sandwich, and I didn't even see it or taste it, so the surprise spinach idea worked. 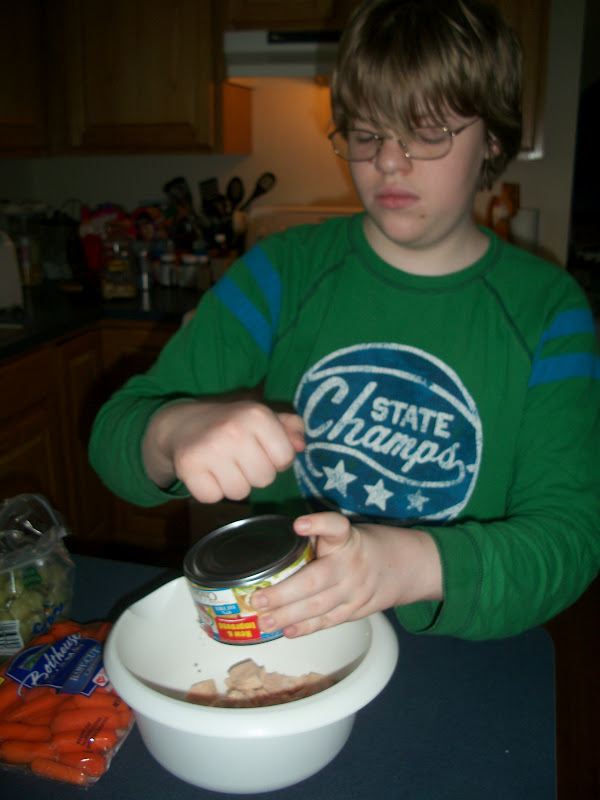 Kyle was proud that he made something that tasted so good all by himself. He also had these words of wisdom, that he wanted me to share. "Busy moms can make chicken salad surprise quickly, and also get their children to eat some fruits and vegetables at the same time." Because of the success of his first recipe, he is really looking forward to sharing another next week, on the next "Cooking with Kyle'. Hello! I just joined your blog. What a great experience fr your son. 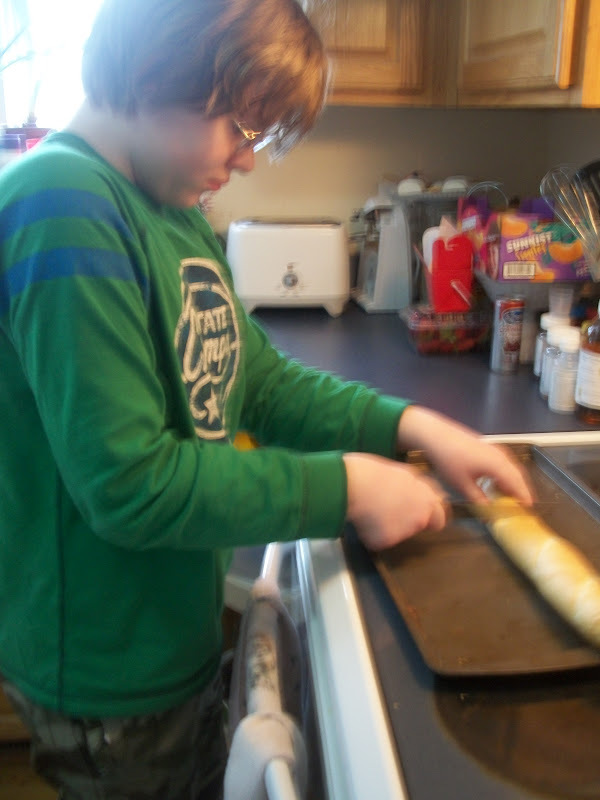 His future roommates and wife will sure appreciate you teaching him a thing or two. 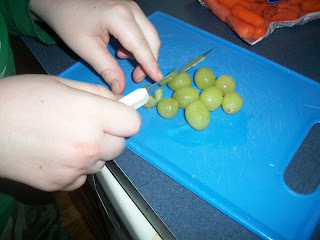 Never even thought of cutting up the grapes smaller so my kids don't even know they are eating them! Great idea! Thanks for linking up to Fun Stuff Fridays! How great that Kyle wants to help make everyone healthier. Thank you for sharing at Sharing Saturday!! I hope you will share with us again this week! great job!! a current and future chef! 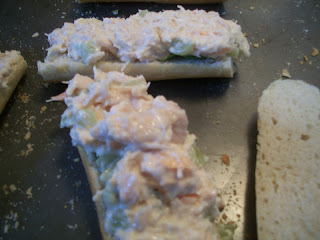 I'm having fun with my boys in the kitchen too! so happy you've joined us at Kids in the Kitchen!